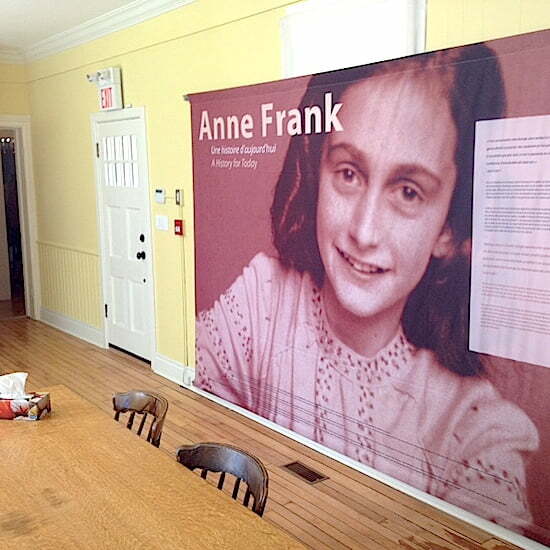 STRATFORD, ONTARIO — Anne Frank House in Amsterdam has a travelling exhibition at Stratford Perth Museum. This is big news for me because Anne Frank House is one of the most well-known museums in Europe, a landmark I have had the pleasure of visiting on three different occasions. While it’s always an adventure to visit Stratford, this time I felt like I was off to hang out with an old friend. Stratford Perth Museum isn’t the only venue where tourists can get a look at the life of this extraordinary young woman. 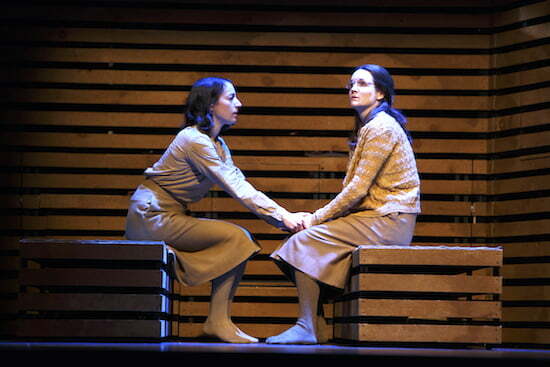 Until October 10 this year, the Stratford Festival will be showcasing “The Diary of Anne Frank,” starring Joseph Ziegler, Lucy Peacock, Shannon Taylor and Sara Farb in the role of Anne Frank. It feels like the Frank family have taken over the city, and in a way they have. Julie Couture, coordinator of the Canadian Projects of the Anne Frank House in Amsterdam, says the museum is happy to present its travelling exhibition at the Stratford Perth Museum, adding Stratford offers people an extraordinary opportunity to combine a museum visit with the viewing of the Anne Frank play at Stratford Festival. When I check into my room at the splendid River Garden House (53 William Street; 519-271-1403) — a spacious, welcoming bed-and-breakfast property sitting on the edge of the Avon River — I take a few minutes to enjoy the charming view of the city of Stratford from my room on the second floor. This bed and breakfast has a lush, green backyard and is connected to a walking path that one can easily take into the town. I can’t help but think if Anne Frank were with us today she would love Stratford, a city that has literally built its name and reputation on legendary writers and fabulous actors. For those who aren’t familiar with the story, Anne Frank was a 13-year-old who was forced to go into hiding with her family during the Second World War after the Nazis invaded the Netherlands in 1940. When Anne’s older sister, Margot, received a deportation order to a forced labour camp on July 5, 1942, the Frank family had no delusions of what this meant — concentration camps, brutality and death. Instead of obeying the order, the family chose to go into hiding the next day in a Secret Annex located in a warehouse accessible by a surreptitious entrance behind a bookshelf. It was here while hiding in the Secret Annex that Anne Frank wrote her famous diary. The family hid in the Secret Annex until they were betrayed and arrested. Ultimately Anne and her sister were transferred to Bergen-Belsen concentration camp on October 30, where both contracted typhus and died. Anne’s father, Otto Frank, survived, only to realize that his entire family was dead. Miep Gies, who had helped hide the family in the Annex gave Otto Frank his daughter’s diary. Today, the Secret Annex is one of the most visited historical landmarks in Europe and Anne Frank is one of the world’s most recognized authors. To learn more about Anne Frank and her family click here and here. My first stop was to the Stratford Perth Museum display, a moving tribute to a courageous family — one of many — who did their best to hide from the Nazi regime. The display goes through the phases of the story, breaking down what happened before the war and the chain of events leading to Adolf Hitler’s rise to power and the political conditions before the war. It also tells the story of the gutsy people who did their best to hide the Franks from the Nazis and explains the events leading to the discovery and arrest of the family. Of course, there is no substitute for actually standing inside the actual Secret Annex, but Stratford Perth Museum does an exceptional job creating an emotional feel and authentic educational experience. Anne Frank House has toured in Quebec, Ontario, British Columbia and Yukon, and has plans to bring the display to Vancouver Island and New Brunswick next year. Couture says more than 45,000 Canadians have seen the exhibition. After leaving the museum, freshening up at River House and having dinner we head out to see “The Diary of Anne Frank” at Avon Theatre (99 Downie Street; 1-800-567-1600). To be honest, I had mixed feelings about seeing this play. I was moved by my visit to Stratford Perth Museum but it did leave me feeling a bit blue. No spoiler alerts necessary — it’s common knowledge the story of Anne Frank doesn’t end well. One thing I liked about the play was the way the actors opened, with each one dropping out of character and sharing a story about themselves when they were 13 years old, the same age Anne Frank was when she went into hiding. During their opening monologues I remember thinking “not much of a stage here,” but almost immediately the set comes to life. That beige, bland stage — the same beige, bland colour of the actors’ costumes — is fully functional with stairs and tables appearing out of nowhere. Lights are brilliantly filtered through the spaces in the walls to illustrate everything from BBC announcements and speeches by Hitler, to lighter moments when the family is laughing together. Give credit to the proficient set and costume designers who put this together. The play is delightfully told through the eyes of Anne Frank, played radiantly by Farb who like the boisterous 13-year-old she is portraying is unable to sit still and is all over the stage literally driving everyone in the house insane. For Farb, this isn’t any play, it’s personal and a privilege for her to enact this role because members of her family survived the Holocaust. Besides Anne’s energy that Farb skillfully brings to life, other interesting dynamics are on display in the theatre. We watch Anne Frank slowly mature from an over-energized annoying kid into a thoughtful, reflective young woman. These relationships are highlighted in continuous, contentious clashes with her stern mother (played by Lucy Peacock) and others who are hiding in the house. The cast does a wonderful job connecting with the audience, creating light and fun moments dotted with uncertainty and fear. By the time the family is sitting at the dinner table listening with excitement to BBC reports about the D-Day invasion and the progress of Canadian, British and American soldiers on the shores of France, I was actually beginning to feel hopeful myself. That is until the Gestapo burst in, guns drawn, ordering everyone in the Secret Annex to remain where they stand. As the terrified family was surrounded someone in the audience gasped in shock — a genuine cry of bewilderment and despair. I felt it as well. No spoilers indeed. Those sneaky actors had actually lulled me into having hope for a good outcome from a story I already knew didn’t have one. For a few moments, I had forgotten how the Anne Frank story ends. On the way back to River Garden House, we passed one last connection to the Netherlands, a short walk up the street from the bed and breakfast. 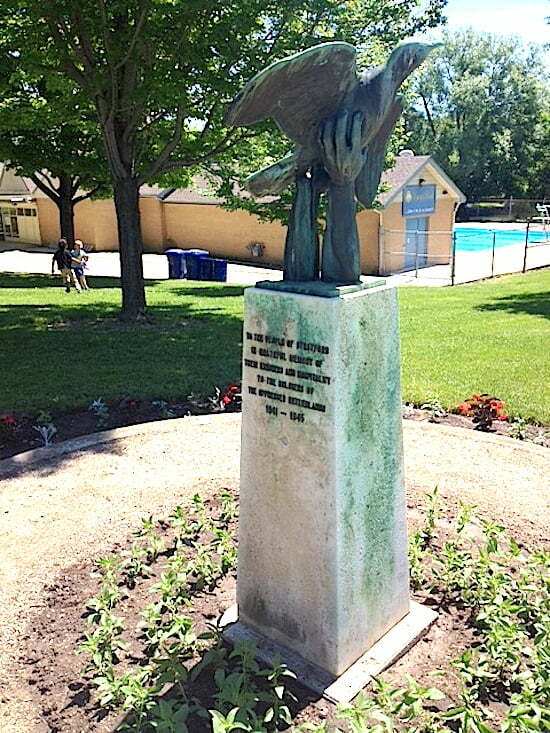 The Dutch Memorial, a gift from the Netherlands after WWII, is a token of appreciation for Stratford’s hospitality to 700 free men of Dutch birth who came to Stratford to form a battalion. From Landmark Walk in Exploring our Heritage, Stratford Strolls (published in 2005): After the occupation of Holland by Nazi armies, Canada invited free men of the world to use Stratford for a military training base. Queen Juliana of the Netherlands came four times to see them. Their “Kazerne” or barracks was a former furniture factory on Trinity Street. For this reason and the participation of the Perth Regiment in the liberation of Holland in 1945, there is a close bond between our countries. The pair of hands symbolizes Canada’s support; the dove is symbolic of the Netherlands. It’s a touching memorial and one that summarizes both Canada’s and Stratford’s deep connection and commitment to the Netherlands. It also makes me feel proud to know that while the Frank family was doing their best to stay alive in the Secret Annex, Canadian soldiers and our allies were doing their best to reach them and so many others. As I said earlier, if Anne Frank were with us today I have no doubt she would love this city.